Along with the Bill Russell Collection I featured a couple of days ago, SCP Auctions has available for sale more Dodgers memorabilia items worth taking note of; including collectibles from Steve Garvey and items from former Dodger catcher Rick Dempsey. Check my favorites below. Be sure to click any pick to embiggen. This is the first time I've seen this kind of commemorative Dodger Baseball, so I'm unsure of its origins. This was within Garvey's personal collection and has been signed by him. Here is another Stave Garvey item. 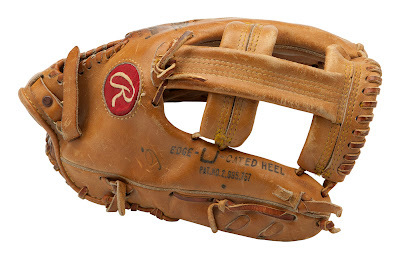 Below is his game-used 3rd baseman glove. 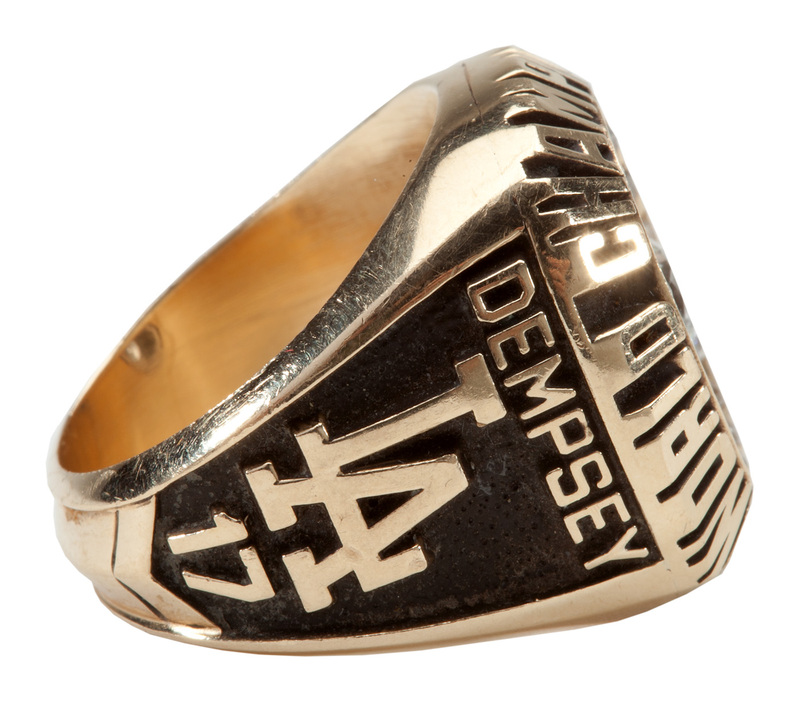 Splitting time with Mike Scoscia, Dempsey tore up left handed pitching, posting a career best 129 OPS+. Rick only had 198 plate appearances but he made the most of them, hitting 13 doubles, and seven home runs. 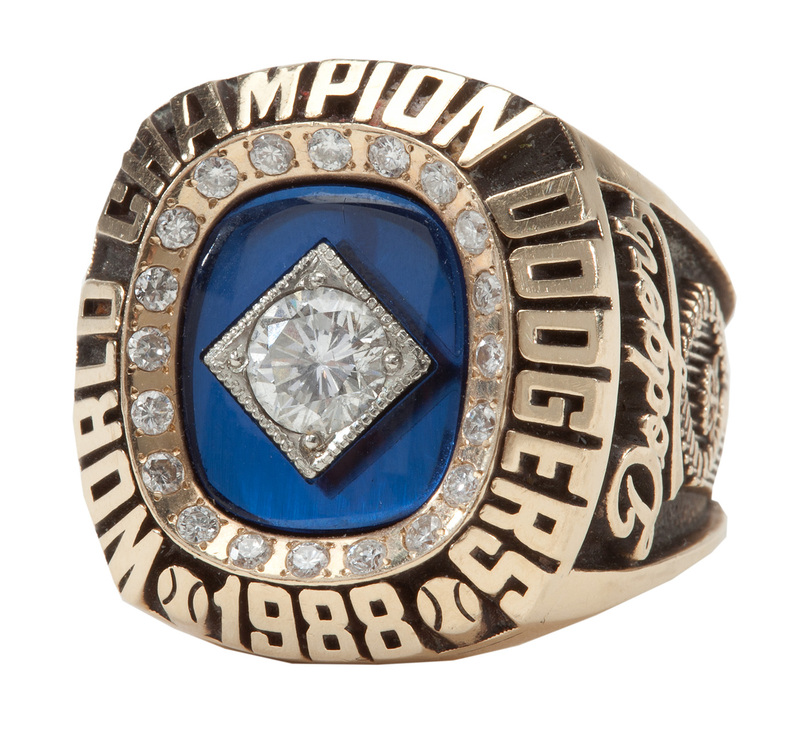 Below is his 1988 World Series Championship ring. 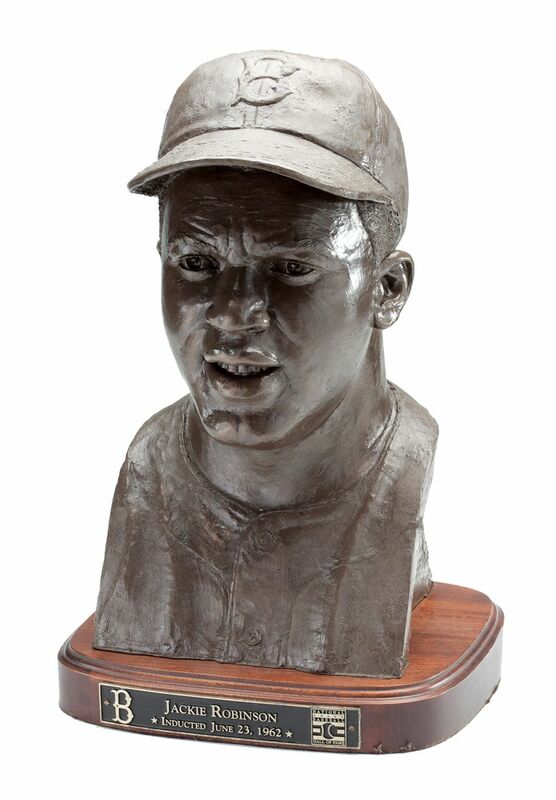 From Bret Saberhagen's personal collection comes this 18-inch high near-lifesize bronze bust of Jackie Robinson by acclaimed artist and sculptor Palmer Murphy. 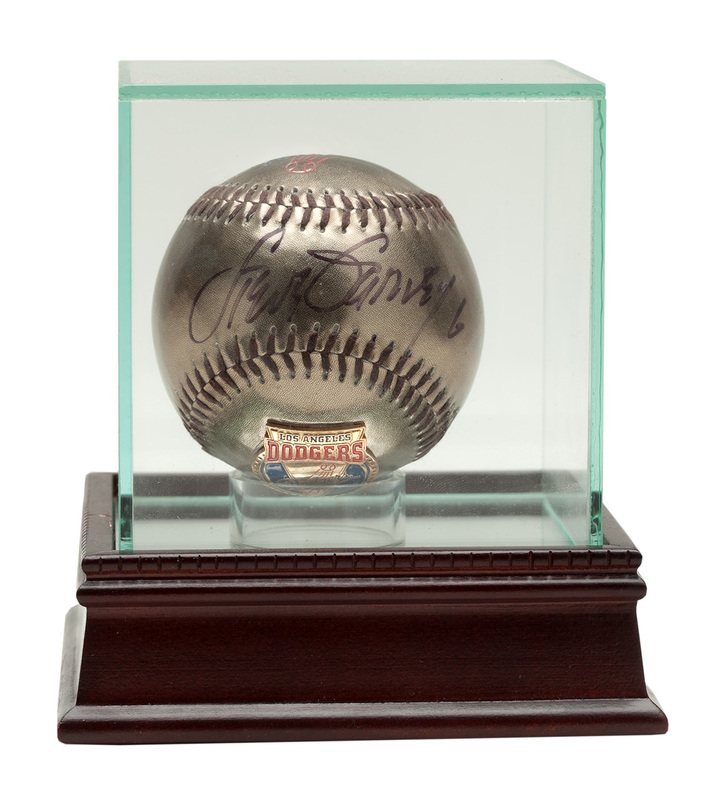 Murphy's work is well known within the sports memorabilia hobby, including producing a number of different busts and even some of the "modern" Hartland statues, but these spectacular bronze pieces issued by the Hall of Fame remain among his most notable entries in the sports field. 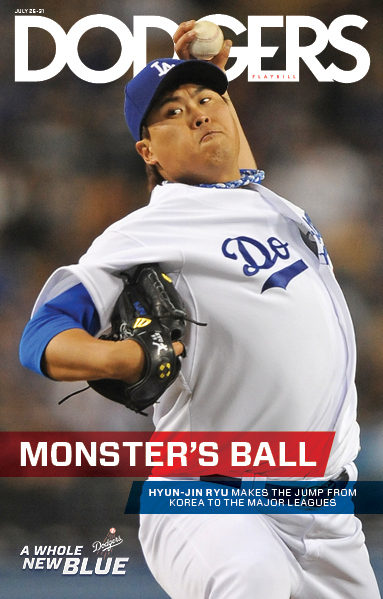 Check out the above 9th edition of the Dodgers Playbill featuring Korean hurler Hyun-Jin Ryu on the cover. Fans can receive the Dodgers Playbill when they enter the parking gates and can also get copies at Fan Services stations during the game. Sports Business Daily ranks every MLB club by popularity. 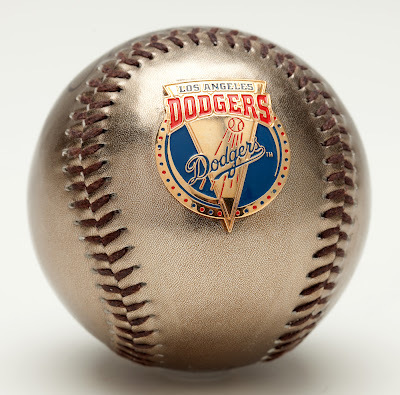 "Los Angeles Dodgers Top 20 2013 PRE-SEASON Prospects in Review," via John Sickels at Minor League Ball. "Why Matt Kemp's voice matters: Ultimately, players have to lead the push to thoroughly clean up the game," via Ramona Shelburne at ESPN. "Talking about things like this is very, very touchy," Kemp told reporters in Toronto on Tuesday. "It's weird. Me, I don't like to talk about this stuff, but I feel like I have to a little bit." Ron Cervenka at Think Blue LA writes, "Has Yasiel Puig turned the corner?". But lost in the excitement of AGon’s and Ethier’s back-breaking blows to the Blue Jays was a simple at bat that in any other situation might have been meaningless, but was instead perhaps one of the most important at bats of the season. It was a seven-pitch walk issued to Yasiel Puig just prior to AGon’s blast. Based upon last nights performance I think it's safe to say that Puig is back in the upswing. Via Mark Saxon at ESPN, "They can't be this good, can they?" If you are so inclined, check out the Greg Maddux Celebrity Invitational golf tournament in Las Vegas on Oct 21st to Oct 22nd. Go here for info. Sports Collectors Daily tells us about a collector with a huge and formerly valuable Ryan Braun collection who feels jilted.